I was needing a few all occasions cards and found an old calendar in my stash. This one had been donated to me a while back for cardmaking so I thought I would see what I could make using it. 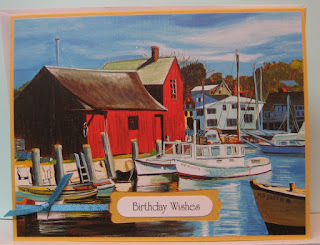 I started with this harbour scene which I thought would make a nice birthday card!! I trimmed the image down to size (4" x 5.25") and punched an opening in the bottom section using the Modern Label punch (SU). I tied a length of 1/8" ribbon between the opening and the left hand edge. I mounted this large element to a yellow card and adhered a little laser printed greeting punchie (SU) in the opening so it was nicely framed. For the next two, I trimmed the images from the calendar pages. 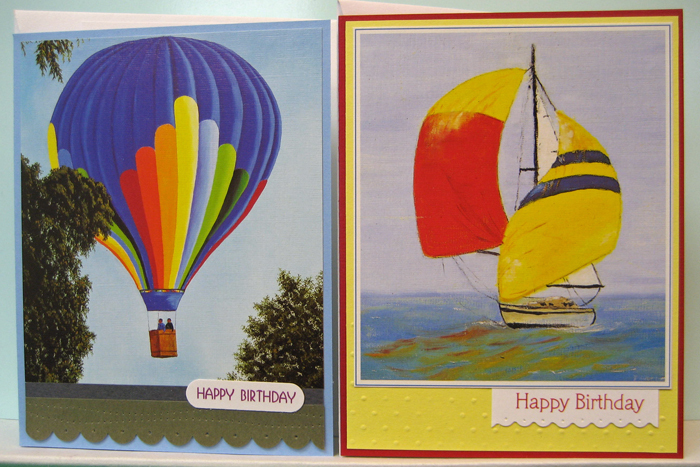 For the hot air balloon card, I added a strip of gray and a green scalloped edged border below that to finish off my top layer. Wanting to add texture I used my tracing wheel on the green border and pierced all the scallops with a push pin. I mounted this layer to a blue card. I added a little word window punchie greeting (SU) with double sided tape over the gray strip and my card was finished. For the sailboat card, I adhered the large framed image to a yellow layer which I manually embossed on the bottom to add some texture. At the last minute I decided to add the little laser printed font greeting to the bottom of the image so I carefully lifted the edge and inserted it using double sided tape to secure it to the back of the image and the yellow layer. I had previously trimmed the bottom edge of the greeting with scallop decorative scissors and pierced each scallop with a push pin to add interest and texture. I glued this large element to a red card front and I had finished another card!! For the lake scene card, I trimmed the image to size (4" x 5.25") then simply stamped "my" with an alphabet stamp set and then mounted the "friend" die cut below it. The die cut actually says "friends) so I simply cut off the "s" to get what I needed for this card. I love the colours!! I mounted this large element to a pink card and I was done!! For the next card I trimmed the lily pond image to 4" x 5.25" and added a length of narrow yellow ribbon before adhering it to a green card front. I tied on an extra length of the ribbon to the one on the front using a single knot to simulate a bow. I layered a small laser printed greeting over a red Modern Label punchie to create my greeting and mounted it over the ribbon using 3D foam tape. For the next two, I used the Word Window punch (SU) to create an opening in my trimmed images (4" x 5.25") and added a length of ribbon from the opening to the left hand edge. I tied the two ends with a double knot to finish the ribbon. I mounted a stamped greeting from the back so that it would appear in the opening and secured it with regular tape. I mounted my finished card fronts to coordinating cards and I had another couple cards ready to go. I am pretty happy with my cards and glad to have reused some wonderful art! !